Paula Haughney lives and works in the east end with a studio in the Bromley by Bow community centre. This unique position means she is fully accessible to the whole local community. Children from Old Palace School opposite often visit for educational talks and Paula is involved in stone carving workshops for schools and evening classes. She also delivers sculpture classes at Redbridge Institute. In addition to this she teaches stone sculpture at West Dean College, from beginner level to post-graduate study. Although Paula took a fine art degree and Masters in sculpture, her stone carving has been largley self-taught. She enjoys and needs the physical challenge. Her first public commission was in 1989, an environment-themed limestone sculpture for Homerton Hospital. Through a number of site-specific commissions since 1988 she has developed her work practice using various types of stone from soft alabaster to hard granite. Most of her public sculptures are produced to a brief, with a specific site and audience in mind. The commissions often include public involvement either in the choice of theme or allowing people to experience the actual making. During the 1990s, Paula was very interested in using discarded stone from demolished buildings and structures, from bits of Old London Bridge to Stratford Post Office. In adopting this approach, this is not just economics or recycling, its carrying on the story – Paula’s turn to interpret, to add herself to the script. An example of this is Nature Throne 1990 for Lee Valley Park which was carved from reclaimed granite, still a significant landmark highlighted on local discovery trails. Paula often returns to nature for inspiration, from the patterning of leaves or fish-scales to the monumental carvings of huge human forms and creatures. 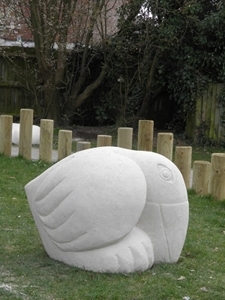 Examples of this can be seen throughout the years to include 1995 Limestone animal seats in Bromley by Bow Park and the four creatures Bear, Bird, Lizard and Rabbit installed in 2011 in Chichester Children’s Centre. She also works with a variety of other themes and her work sits just as at home in the corporate environment of St Katherine’s Dock as it does in Battersea’s Doddington & Rollo Estate where two major works entitled ‘The Beginning’ have sat, un-damaged and enjoyed by the community for the past twenty years. Other works have taken a nautical theme, a prolific period being 1992 to 1993 with two major commissions in Herne Bay, Turk’s Head Knot and Boy with Boat that won the Rouse Kent Public Art Award. In addition, sculpture seats have often featured down the years. Since 2000, Paula has carved various relief works for wall and floor with a prominent one in 2010 being the Compass Rose for Fairland Park Haringey that serves as meeting point and way-finder, produced in collaboration with mosaic artist Sheenagh McKinlay. In 2011 she has continued to receive public commissions in large site specific sculptural works. Paula continues to exhibit privately.